I came across this this recipe and immediately got it in my head that I would make peppermint patties for my dad, nevermind the fact that I had no dipping chocolate in the house. So, off I went to Surfas, where I also bought THREE POUNDS OF SKOR BITS (why? I don’t know) and returned home ready to make candies, only to discover I was out of corn syrup. Not about to go to the market now, I searched the web and came across a corn syrup-less recipe and decided to give it a go. These are minty, chewy, and delicious and taste just like a York peppermint patty. Would I make them again? Hell no. While I love to eat chocolate, I am horrible at dipping things in it. In fact, I ended up using a pastry brush to brush the chocolate on because I had trouble digging the first patty out of the chocolate after it fell in. So you see, I have absolutely no chance of ever having a career as a chocolatier. Unless ugly dipping styles become popular, then I’d be highly successful. Ugly photos of the messy process here. In a large mixing bowl, combine condensed milk and peppermint extract. Beat in enough confectioners’ sugar, a little at a time, to form a stiff dough that is no longer sticky. Form into 1 inch balls, then place on waxed paper and flatten with fingers to form patties. Let patties dry at room temperature two hours, turning once. In double boiler over low heat, melt chocolate with shortening, stirring often. Dip patties, one at a time, into chocolate by laying them on the tines of a fork and lowering the fork into the liquid. (Or say screw that and use a brush to coat them, like I did.) Let cool on waxed paper until set. that’s awesome! despite the messy process they turned out pretty nice looking. That was the worst part of making these – I hate dipping stuff in chocolate. At least my recipe had butter and called for chilling the patties. They were really, really firm and held up to the chocolate well but I found there was no forgiveness in the chocolate. If there was a hole and I tried to cover it up, it just made it worse. I love dipping! I just drop the item straight in and then pick it up with a fork and use my small offset spatula to pull some of the excess chocolate off. 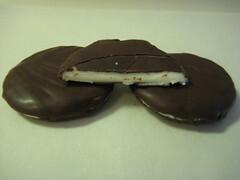 It worked with the homemade thin mints, so it should work with peppermint patties. I’ll have to try! yeah this recipe has been grouped with cake balls, oreo truffles, and thin mints — DELICIOUS, impressive, and a huge pain to make the 1st time around. (see a pattern here? they’re all dipped!). I’ve never heard of anyone making homemade peppermint patties before — and, given the difficulty you experienced with them, I can understand why. Hopefully they tasted good enough to make the process worthwhile.